I recently started a newsletter using Nuzzel and have found it to be one of the most well thought-out curation platforms out there. As a news junkie now I can curate my own daily newsletter instead of sharing links throughout the day using different mediums. Nuzzel Newsletters are a new product from Nuzzel which enables people to curate their own daily newsletter. 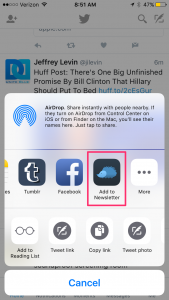 You can read more about the thinking behind Nuzzel newsletters in this blog post and see an example of my newsletter here. My favorite part of the newsletter is how easy it is to add stories. For the most part I use the iOS extension (see screenshot) and Chrome bookmarklet. As a heavy Instapaper user I’m already comfortable with saving articles for later using my phone and the browser. Adding stories to my Nuzzle newsletter is a natural extension of that behavior. There’s also ample room for editorial content. You get to name each newsletter, add a summary, and can comment on any story. Very nice! Twitter is a firehose and it works well as a living stream of real-time content. But if you’re the type of content consumer that doesn’t have the time to sort through a flood of tweets a well-curated Nuzzel newsletter is like a drink of water in the desert. A big question is how you could discover the newsletter(s) that are right for you. The onus is on the newsletter creator to acquire subscribers. Nuzzel provides tools to import contacts and promote your newsletter on social platforms, but if you don’t have a large pre-existing network subscriber acquisition can be a slog. If you ask me, this is the biggest challenge for Nuzzel newsletters – how do they create the network of curator/consumer connections that Twitter has? That’s a moat that’s not easily replaceable. Integrating with a Read Later Service? My one wish is for Nuzzel to combine in a smart way with Instapaper or another read later app. It would be cool if I could add to Instapaper and my Nuzzel newsletter at the same time. And if my Instapaper highlights became Nuzzel comments, and so on. In summary, Nuzzel Newsletters provide me with an outlet that I’ve wanted for a long time! You can subscribe to my newsletter here.